Metal is a leading material in a variety of branches of modern industry. Metal high-quality products — guarantee of reliability and safety. Metal is particularly popular due to the large variety of alloys used. One of the most popular today steel metal products and various grid connection. They are divided into types depending on the application and the materials used. Grid connection and made significant progress in its variety lately. They are very economical and are fairly common, their use can be seen everywhere, in every field. This kind of flexible pipe needed to ensure secure communications. Basically, two types are produced: rolled and corrugated metal hose. Their advantage is that they can withstand great pressure and sufficiently different reasonable price. Resistant to rust metal pipe used in oil pipelines. In addition, they are popular in other areas, as quite resistant to any influences. This device for making compensation and any changes such as temperature changes. Expansion joints are divided into manufacturing the material. The choice of material is determined depending on the operating environment. Equalizers are cloth, rubber bellows, seals and lens. Expansion joints are installed inside the pipelines and ensure there is the necessary pressure. They are suitable for any kind of communication and actively used by modern industry. I got the name according to the method of manufacture. It is formed by a weave of longitudinal and transverse wires. Classified data grid application. With these grids sieved bulk materials, filtration, drying is carried out. Thus, this type of mesh used in virtually all areas. Its price varies depending on the fabrication material which defines a long-term service life and corrosion strength. It is the most common form of grids, they can be seen on almost any private land. The use of them quite extensively in the construction of fences or livestock for a certain territory. Most often, these meshes galvanized, they differ in the size of cells. The most common varieties are the long-drawn-exhaust, welded Mason. The first is used for plastering and is considered the most cost-effective option. 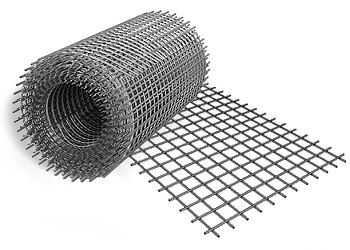 The second type of mesh is particularly rigid, used in almost all stages of the construction work on the fences to installation of underfloor heating. The main area of application — construction. The main difference from conventional mesh — originality alloys for fabrication. These grids can be decorative appearance, they have high transparency. To filter used low carbon grid. Welded wire types are used for small enclosures, such as cells or greenhouses. A special kind of among fencing — mesh polymer. They are made of synthetic polypropylene that has high elasticity, strength and durability. Grids are separated at the place of use. The first type is used for concrete screeds, the second to increase the strength of the structures, the third to increase stability and prevent cracks. Grids quite economical material, however, have the essential steps in the construction and reconstruction of buildings. Safety barriers are responsible for fencing and prevention of emergency situations. For example, when the barrier pressure jumps obliged to take over the voltage, thereby damaging the progress of work. The barriers are grouped into four levels of reliability. The first is self compaction of fuel or other hazardous material, the second is the material shell pipes, reinforced the equipment the third wall and the fourth is the localization in the event of an accident. Maximum security design is achieved by using all barriers. This is necessary when working with flammable, explosive or other substances destructive action. We supply a wide range of metal hoses, metal grids and connections. All products are certified. The price is formed taking into account the European rates on metal without including additional costs. In the production of metal hoses, metal grids and connections are used only materials of the highest quality. We easily buy wholesale any semi-finished products for large-scale productions. We provide favorable conditions for retail customers. Our company has a high level of service and speed of service. Metal from the company «Electrovek-steel» corresponds to the domestic and international quality standards. We supply metal hose, metal grids and connection of standard and custom settings in the shortest possible time from warehouses in Russia and Ukraine. All products of our company are manufactured under the strict control of the entire process chain that guarantees the highest quality. Technological capabilities allow production to produce custom orders without the need for the type of products in the basic version. Practice for discount prices. Delivery — as soon as possible.